It is a high-voltage drama every year at every business and engineering college worth its salt in India. Human resource departments of all major companies set aside a full quarter during which they go talent hunting, positioning their brand to prospective recruits. BT kept an ear to the ground to capture the action on campuses this year. We carried out our own research with some help from minglebox.com, an education portal for information and advice on exams and careers (for Bschools), and employment portal firstnaukri.com (for engineering colleges). CHECK OUT:India's Best B-Schools - 2011 rankings out! The details of the recruitment process at the hallowed Indian Institutes of Management, or IIMs, and the Indian Institutes of Technology, or IITs, and other top-notch campuses, were closely examined to cull out leads. We obtained data from 26 of the best institutes. Many others were contacted but their data was not available in time (for instance, IIM Bangalore). Some others, such as IIM Kozhikode, declined to reveal full information due to confidentiality agreements. We sought information primarily on the number of hires, as many campuses declined to reveal specific salary offers. Of the 26 institutions on our list , 16 were B-schools: IIM Ahmedabad; IIM Calcutta; IIM Lucknow; IIM Indore; IIM Shillong; Indian Institute of Foreign Trade Delhi; Delhi University's Faculty of Management Studies; Management Development Institute Gurgaon; TA Pai Management Institute Manipal; IIT Bombay's Shailesh J. Mehta School of Management; IIT Delhi's Department of Management Studies; Narsee Monjee Institute of Management Studies, Mumbai; Xavier Institute Of Management Bhubaneswar; Loyola Institute of Business Administration Chennai; Symbiosis Institute of Business Management Pune and Institute of Management Technology Ghaziabad. The 10 engineering colleges were IIT Chennai; IIT Roorkee; IIT Guwahati; National Institute of Technology Warangal; Motilal Nehru National Institute of Technology Allahabad; PSG College of Technology Coimbatore; Indian School of Mines Dhanbad; IIT BHU; Anna University Chennai and National Institute of Technology Trichy. Most of the recruiters on our list are regular annual campus visitors who have honed their skills at spotting 'right fit' candidates for their companies. 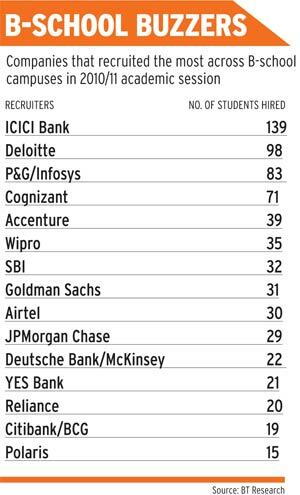 This year ICICI Bank turned out to be the top recruiter on B-school campuses with a total of 139 hires replacing Cognizant from last year. It had ranked second last year followed by Deloitte, Infosys and YES Bank. "We like to avoid prima donnas, people who think they are God's gift to mankind," says K. Ramkumar, Group Chief Human Resources Officer, ICICI Bank. The bank sends "DNA anchors" - or people who reflect its identity and work as its brand ambassadors - to seek out talent on campuses. The bank has also developed its own psychometric analysis to gauge ability. "We do not want people who expect a silver spoon. We need people who are realistic and do not view problems as difficulties," says Ramkumar. Similarly, Procter & Gamble, or P&G, which was the third largest recruiter with Infosys, has been scouting for people who demonstrate leadership abilities. "We look for people with the ability to take on responsibilities at an early stage, with a strong value system and a result-oriented approach," says Sonali Roychowdhury, Head of Human Resources at P&G India. P&G has risen way above its FMCG rivals in campus recruitments, and is regularly seen at all the IIMs, XLRI Jamshedpur, National Institute of Industrial Engineering, Mumbai; Mudra Institute of Communications, Ahmedabad; Management Development Institute, Gurgaon; Jamnalal Bajaj Institute of Management Studies, Mumbai; IIT Delhi and the Delhi School of Economics. This year, it tapped 10 new B-schools, in addition to the 15-odd institutes it visits each year. While 87 per cent of its recruitments were from B-schools, the remaining were engineering graduates. Our survey, conducted by minglebox.com, shows a shift in student preference from sectors such as investment banking and information technology to fast moving consumer goods, or FMCG. As in the past, domestic companies made the bulk of the recruitments, with only around two per cent being hired by foreign firms for positions abroad. At IIM Ahmedabad, for instance, other than banks, consulting firms such as Oliver Wyman, Analysys Mason and Heidrick & Struggles made offers for jobs in New York, Dubai and Singapore. Among the marketing firms, Hindustan Unilever Ltd, or HUL, and P&G offered jobs in Singapore. Cadbury Kraft and Dabur, too, made global offers. However, hiring patterns are clearly undergoing a shakeup. IIM Lucknow saw a record 206 companies make 528 offers. Aside from the traditional favourites, Jaipur Rugs, an SME firm, also made an entry on campuses as it sought talent for its handicrafts business, while Reliance Industries scouted for talent in sports management. An interesting entrant was the Nodwin Group, a Gurgaon diversified business group, which offered entrepreneurship roles to candidates willing to set up their own ventures. Microfinance players such as JFS and BASIX also found takers among the students. Yet, it should not be assumed that all is well on our campuses. ICICI Bank felt that the training at some Bschools was far removed from what organisations wanted. "We have been going to campuses for over three decades and feel that many institutes do not make an attempt to partner with companies to understand their real needs," says Ramkumar. He was unhappy that some institutes were "too full of themselves" and thought they could "dictate terms" to recruiters. But there is a difference of opinion here too. Dhananjay Bansod, Chief People Officer, Deloitte India, which emerged as the second largest recruiter on B-school campuses, and features on the list of top-10 recruiters in engineering colleges, says both companies and campuses are undergoing a radical change. "Today, students are very clear about where they want to go and their choices are not blindly driven by money or the brand," he says. Similarly, companies are clear about what kind of recruits they want. "However, it is also our larger responsibility. We have taken it upon ourselves to groom young talent into highly employable talent," he adds. Thus, as Bansod says, the onus is on recruiters as well to engineer partnerships.